Je voudrais partager avec vous le buffet d’anniversaire que j’ai realise’ recemment pour l’anniversaire de mes deux garcons . 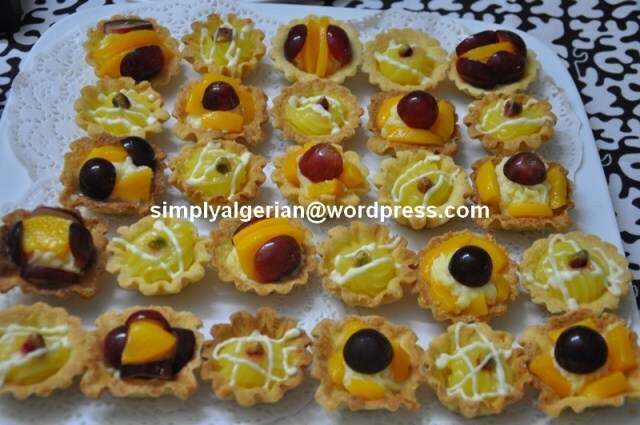 des mini tartelettes au lemon curd, creme patissiere et fruits, cup cakes vanille garnis de chocolat, et le gateau d’nniversaire sous forme de terrain de foot . Je voudrais aussi saisir cette occasion pour vous parler de mon premier article paru dans le magazine anglophone ailaa qui traite les differents aspects de la famille musulmane. vous pouvez y retrouver ma recette de » poulet Algerien aux olives » ( click ) et decouvrir le magazine par la meme occasion. 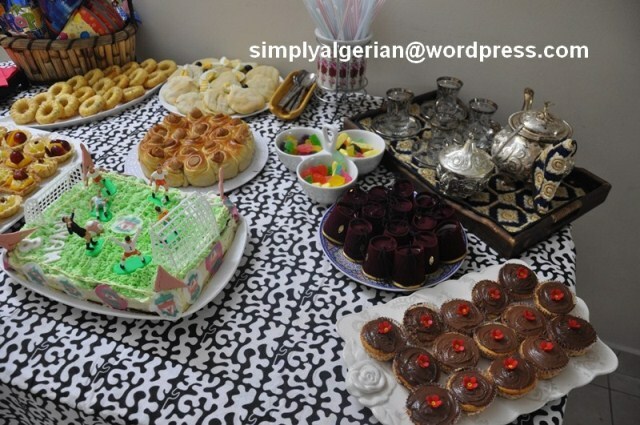 Last saturday was my two boys birthday so i thought of taking few shots of the party I hosted and share them with you. 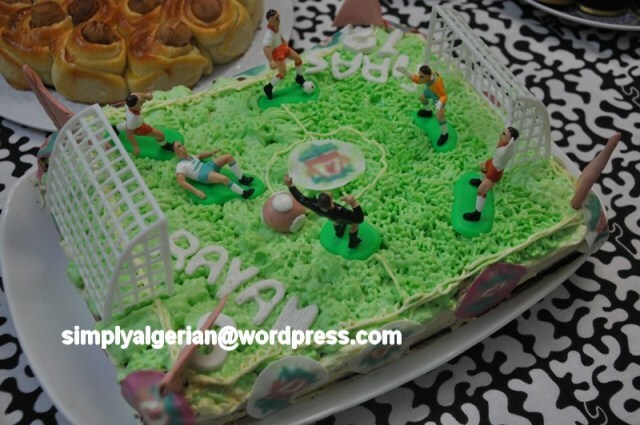 on the menu, there was savory mini cakes, stuffed tuna sandwiches, rose shaped sausages turnovers, cupcakes, custard and lemon curd mini tarts, , and last but not least a soccer field birthday cake. I also want to take this opportunity to talk about my first article on ailaa magaine . click here to check out my recipe of Algerian chicken tajines with green olives and discover the magazine . 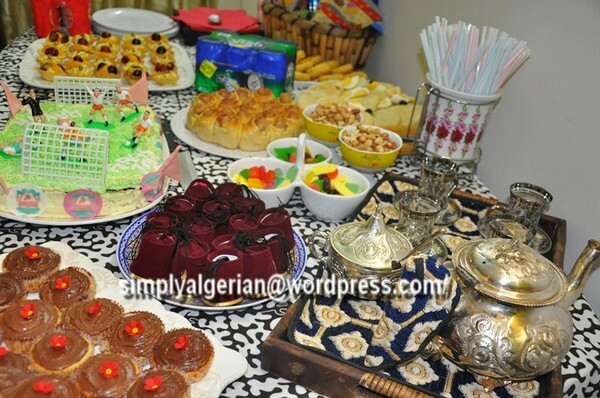 A recipe of horyat elmatbakh, of the arabic food chanel fatafeet ) . 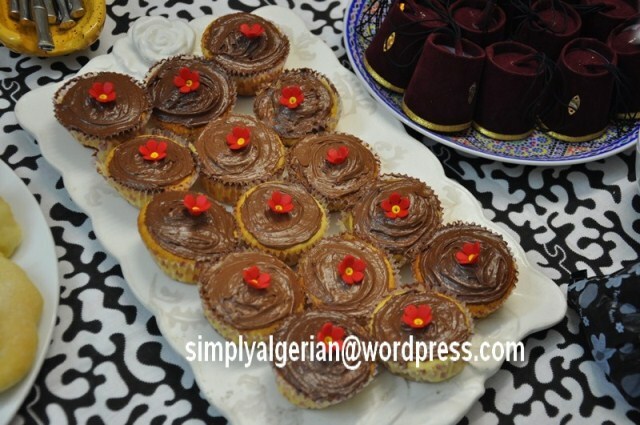 these cupcakes are wonderfully soft and delicious . I thoroughly recommand this recipe and will definelty make it again . 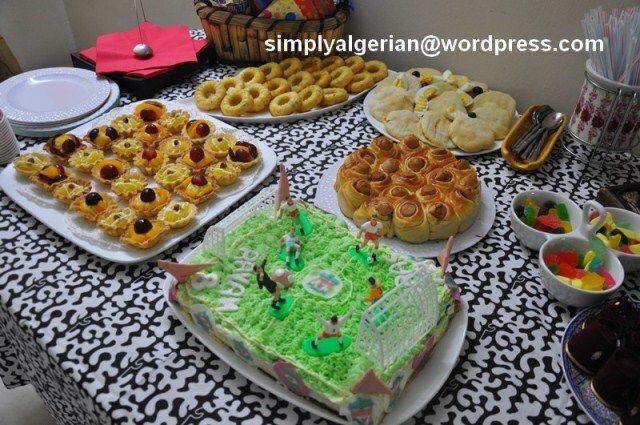 une recette de horiyat matbakh, la fameuse presentratrice Algerienne de la chaine fatafeet. une recette que je garde precieusement et que vous conseille vivement d’essayer. Commencer a battre le beurre ramolli et le sucre jusqu’a l’obtention d’un melange blanchatre. ajouter les oeufs un a un tout en continuant a battre ( a ce stade j’ai ajoute’ de la vanille et du zeste de citron) . tamiser ensemble farine et levure chimique et commencer a l’ajouter au melange tout en l’alternant avec le lait , jusqu’a l’epuisement de ces deux ingredients. chemiser un moule a muffin avec des caissettes en papier, verser l’equivalent de deux cuillere a soupe danss chaque cavite’ et enfourner ( 180 degres) pendent une vingtaine de minutes jusqua ce que le le dessus gagne une couleur doree’ . Beat the butter and sugar until light anf fluffy.add the eggs , one at a time ( at this stage, I added few vanilla drops ad lemon zest ). beat well . In a separate bowl, seive the flour and the baking powder then alternatly add it with the milk . evenly fill the cups with the mixture and bake for 20 mn . 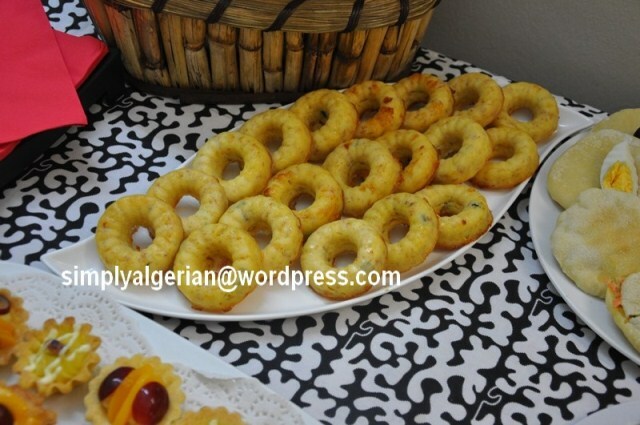 I used Tunisiana recipe to which I added my tuna bourek filling and baked in silicone mini rings. pour la pate, j’ai utilise’, celle des pogacas turques ( click ) puis les ai faconne’ en bouquet de rose ( click) et cuit dans un moule a charniere. 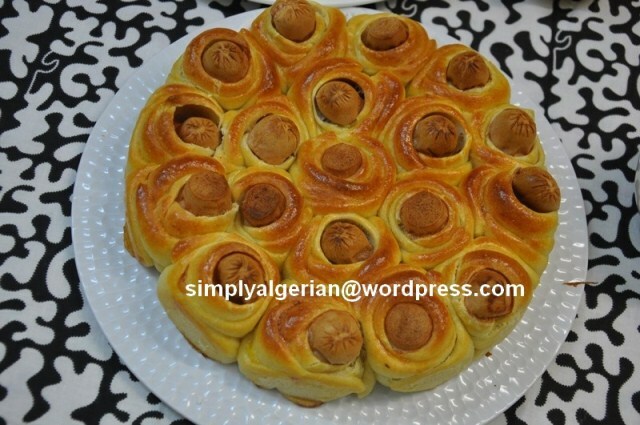 I used the Turkish pogaca dough ( click) shaped them into a bunch of roses ( click) and baked them in a cheese cake mold. j’ai prepare’ le meme gateau et la meme mousse que mon » back to school cake » ( click) mais en doublant les ingredients et en le decorant de chantilly et d’accessoires de terrain de foot que j’ai achete’ dans un magazin specialise’. I used the same basic cake and chocolate filling as my » back to school cake ( click), just doubled the ingredients to have a bigger cake . 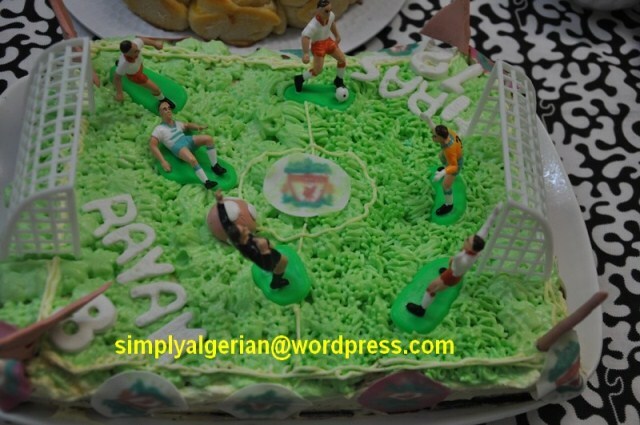 decorated it with whipping cream and soccer field accessories bought from a specialized pastry shop. 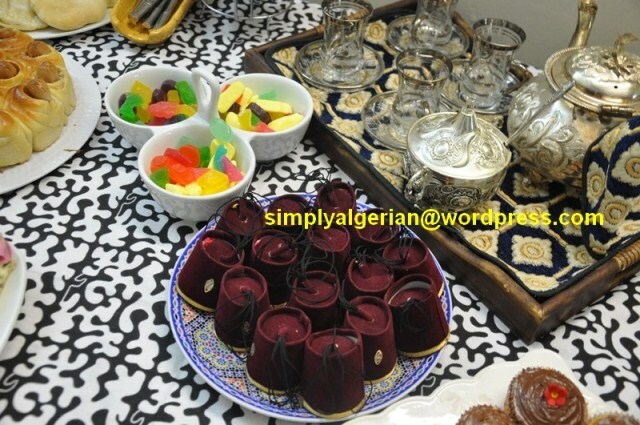 these traditonal tarbouches/ chachiyas/ hats were a hit among my guests……they are used as « porte-drages » in Algeria and usually destributed to guests during the circomcision ceremonies during which the circomcised child usually wears traditional clothes including this tarbouche. 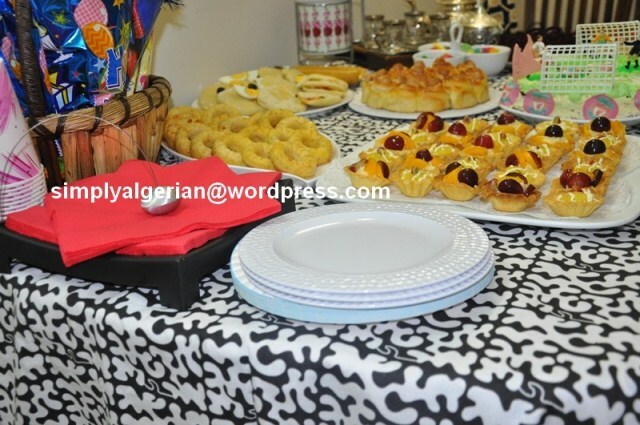 ces tarbouches traditionnels/portes drages ont eu un grand succes parmis les invites. on les sert generalement l’ors des ceremonies de circoncision en Algerie , histoire de reproduire l’habit de l’enfant circoncie qui doit porter une tenue traditionnelle dont ces tarbouches/ chachiyas sur la tete.